I used to love those group runs once a week when I was marathon training. Like just put it on cruise control, and let someone else carry you! Yes! That's exactly how I felt. There was no slowing down! Great to see you came out with the group! Hope to see you at more soon! I definitely will be! I'm so glad I finally went. Great job, definitely a deserved A+ grade! 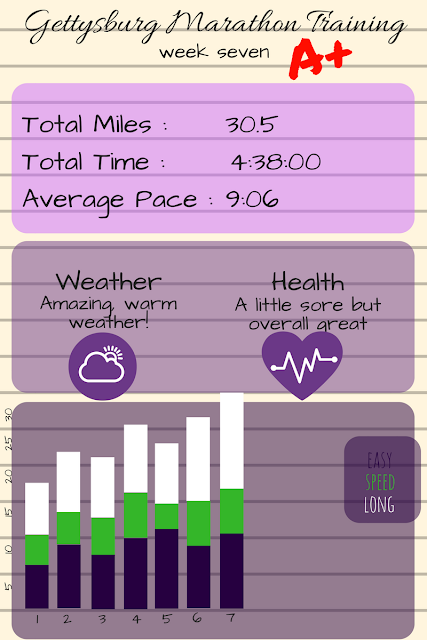 I haven't been on a group run in a really long time, it can be really motivating! Great momentum carrying you from week to week! Lots of great first this week too. That Tuesday workout sounds tough!!! I'm glad you had a good experience with PB&R. I really like that group and plan to run with them most Saturdays. Do you feel like you have to run faster than Dan now? Whenever Roger starts running faster than me, I get annoyed and want to run faster than him... and I'm not a competitive person at all! I'm still faster than Dan and I think I always will be, because I put in way more miles than him. Luckily we're not that competitive with running and both just want to do our best no matter who ends up winning! First of all, way to go DAN!!! Getting too fast, eh? ATTA BOY! Also, I'm really proud of you for getting out there for a group run. As much as I love my solidarity, I do really miss my Tuesday night group runs I used to do years ago! Nice week! I found your blog through Courtney. I'm a fellow PA runner!! Girl, you are smashing this training out of the park! Another A+ week?! Way to go Dan, too! Just found your blog - happy to be following along! Looks like a great week! Hi, Gretchen. It's good to see you back on the Weekly Wrap. What a wonderful week of "firsts". I'm glad you had a good experience with your group long run. That should make those miles fly right by. Good luck as you continue to train for your marathon. Thanks for linking.